"I and my mother were really terrified when BISE Lahore team reached our home late at ni...ght before announcement of the result. You may think its ridiculous but I always said to my mother that I wanted to be like Quaid-e-Azam Muhammad Ali Jinnah," he said. "Quaid-e-Azam is a role model for me." 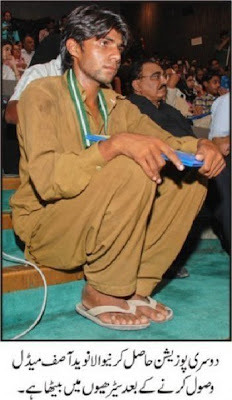 Unfortunately, all the seats were occupied during ceremony, besides, due to his ragged clothes and poverty, he wasn't given the seat to sit, and so he sat on the stairs. Guys! The above given is the detail of this picture. When I looked at this picture, I could not stop my tears from rolling out of my tears. There is hell of things meshing up in my mind but I am unable to bring them in some order and then write here. Guys! this is Pakistan which is defined as "Islamic Republic of Pakistan"
Few days back, i got something astonishing to read. It was a quotation by BANO QUDSSIA who has been a marvelous writer. She writes in her novel RAJA GIDH about the social hoax. She says "all those who created Pakistan for an ideology are now a days in a desperate search of that ideology." Who created Pakistan? Perhaps Quaid could give the best and correct answer. But what i know is about the common men who voted, prayed and helped few sincere leaders to bring this Muslim state into existence for an ideology. But sorry to say that ideology is no where now a days. At least i could not find it. People like Asif who might have migrated from India or some rural area to the vicinity of some big city for their basic needs, ideology, better future and the revival of their integrity and self respect. But they did not know about out of frying pan into the fire. The feudal lords disguised in 3piece suits are perhaps the destiny of this country. It is more than 60 years now since this country came into being. But this culture is same. Just faces change, but the social, cultural hoax remains the same. Perhaps some day we could make it better but does not seem changing. I placed myself in dirty clothes, an ordinary chappal in my feet and sitting on the stairs of Alhamra hall holding the position certificate in my hands. I felt myself a waste. I achieved the best at my age and resources which no one with full resources and facilities could get, but it could not earn me a chair to sit on after i had been honored. I sank into the fake integrity and social injustice of this society which calls itself "Islamic Republic of Pakistan". Here I would like to all to read a bit more on the role of blessed people and how our social life cycle is ruined in their absence.These are people like Naveed Asif. The article is "Blessed People: An argument to the existence of society." Ishfaq Ahmed writes in his revolutionary book "ZAVIA" that we have to give back the social identity and integrity to such blessed people who do wonders in spite of having no resources and facilities. We have to acknowledge their intellect, quality and hard work. These are blessed people. If we do not give them back their self respect, their tears can engulf the whole society. So sad and so bad. Wish someone takes note of this powerful note here on this blog. But who is listening in the din?